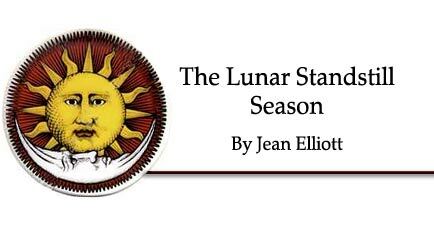 Lunar Standstills by Jean Elliott, DFAstrolS., RCAstrol. In 2005 and 2006 we are in a major lunar standstill season. For several years now some of my astrological camping colleagues and I have been trying to establish what lunar standstills are and when they occur. There is usually no reference to them in most standard astronomy books, though they are referred to by authors who have written about ancient megalithic sites such as Callanish on the Isle of Lewis off the west coast of Scotland. Lunar standstills are in a sense the polar opposites to solar and lunar eclipses. During a lunar standstill the Moon has to be roughly at right angles to the Moon's Nodes, as opposed to being on or near these Nodes at times of eclipse. Also the Moon's Nodes have to be in the signs of Aries or Libra, or Virgo or Pisces: the signs near the equinoctial points. The Moon's North Node is in Aries or Pisces during the major lunar standstill season and in Libra or Virgo during the minor lunar standstill season. In order to understand lunar standstills, it is necessary to realise that every month the Moon will reach its lowest or highest declination, roughly 28º north or south of the celestial equator, or to express it another way, roughly 5º beyond the ecliptic path. Also every month, the Moon will reach its minimum declination at 18º north or south. The Moon's extremes in declination (or position in relation to the visible horizon) become observable and interesting during the lunar standstill seasons. During the winter months the Full Moon culminates higher and higher in the sky until it reaches its maximum height throughout the year at the full Moon nearest the winter solstice. In the summer months the Full Moon culminates lower and lower in the sky until it reaches its lowest position above the visible horizon at the Full Moon nearest the summer solstice. So the Full Moons nearest the solstices do the opposite to the Sun which is lowest in the sky at the winter solstice and highest in the sky at the summer solstice. Whichever hemisphere you are in, the experience is the same. Over an 18.6 to 19 year period, the Full Moons nearest the solstices swing much like a pendulum. In 2005 and 2006, these Full Moons will be at their highest and lowest positions in the sky over this approximately 19 year period, reaching declination 28º +/- (north/south). Also the First and Last Quarter Moons around the time of the equinoxes can be seen at their highest and lowest declinations. In 2015 there will be a minor lunar standstill season, occurring about 9.3 to 10 years after the major lunar standstill season. What occurs now is that the Full Moons nearest the solstices and the First and Last Quarter Moons nearest the equinoxes will reach a minimum declination of approximately 18º+/- (north/south). When this occurs the Full Moon at the winter solstice will be at its lowest in the sky over an approximately 19 year period, while the Full Moon at the summer solstice will be at its highest in the sky over the same period. If you observed the full Moons nearest the June and December solstices during a major lunar standstill season, you would notice that the height and depth between the two become extreme with an arc of 56 or so. When observing a series of minor lunar standstills you would notice that the height and depth between the two are not so great and less than most full Moons around the solstices with an arc of roughly 36 between the two. The following is a diagram showing a major and minor lunar standstill of the Full Moon. It has not been drawn to scale, but is a diagram of the tropical regions of the Earth showing the terrestrial latitudes of where the Full Moon is overhead at the standstills in the northern hemisphere. In the southern hemisphere, the Full Moon is south of the Tropic of Capricorn at the major lunar standsill, and north of this Tropic at the minor lunar standstill. The current series of major lunar standstills occurring in 2005 and 2006 and the next series of minor lunar standstills occurring in 2015 are listed below. The positions of the Moon and nodes have been given to nearest degrees. The dates given are for the exact Full and Quarter Moons, but lowest and highest declination may occur within a day or two of the exact phases. Date	 Standstill type Full Moon North Node Dec. The visible Moon, reaching its highest and lowest declination during its First and Last Quarter phases nearest the equinoxes during the major lunar standstill season, seems to have been the part of the cycle that was of most interest to Neolithic peoples. Maybe they were interested in the Full Moon too - it is hard to believe otherwise. A First Quarter Moon rises at noon and sets at midnight. The Last Quarter Moon is visible from midnight and sets at the following noon. It should be noted that these First and Last Quarter Moons are either in the solstice signs of Cancer and Capricorn or in the other signs, nearest the solstice points, Gemini and Sagittarius. Throughout the major lunar standstill period, the relevant Full Moons lie near the solstice points and the Moon's Nodes are close to the equinox points. A major one north will be followed by a major one south just under 6 months apart. The same applies to the minor lunar standstills. It is believed by some that much emphasis was placed on lunar standstills by the builders of the megalithic sites on the western fringes of Europe and in the British Isles. Perhaps they had an understanding, on some level at least, of the Metonic Cycle (when the Moon reaches the same phase and same degree of the Zodiac every 19 years); the 18.6 year Nodal cycle, the cycle of Eclipses and possibly the Saros cycles. There are at least two eclipse seasons per year. A Saros starts with one Solar eclipse, followed by another one in the same series 18 years, 9 - 11 days later. The Solar eclipses which take place in one year each belong to a different Saros series. A Saros series is made up of roughly 72 Solar eclipses over a 1300 year period. Some of these megalithic sites are believed to be about 5000 years old, older than the development of astrology and astronomy in the Mesopotamian civilisation and much older than Meton, the Greek (c.430 BCE), who was accredited with the discovery of the Metonic cycle. Robin Heath has explained how the Aubrey holes, the first phase of Stonehenge, were used to predict eclipses and has done much work generally in helping us understand ancient archeoastronomy in relation to stone circles. The 56 Aubrey holes were likely to have been used to predict lunar standstills as well. It is unlikely that the builders understood these cycles in the same way as we do now, but their observations over long periods of time may have enabled accurate predictions of lunar standstills and eclipses. Considering that Neolithic people did not live very long lives, this would have been an amazing achievement and knowledge must have been passed on from parent to child. The lunar standstills, whether they were being observed during the Quarter or Full Moon phases, were apparently prominent events observed from some stone rows, such as the Merrivale Stone Row on Dartmoor in the south west of England, from stone rows on the Isle of Mull off the west coast of Scotland and at Temple Wood stone circle near Kilmartin in Argyle. Other examples are rings of standing stones west of Aberdeen, Scotland. There are many others throughout the western fringes of Europe. The combination of stones and prominent hill tops, with their notches, were one of the major ways Sun and Moon positions were noted at significant times. The Callanish stones, at latitude 58.12 north, are famous for picking up the lunar standstills at their most southerly positions against the hills on the horizon. There is about five hours of darkness in midsummer. It is worth pointing out too that at this latitude during the major lunar standstills north the Moon hardly sets. You can observe these standstills from anywhere although it would be better to be in the country with a good view. According to Service and Bradbery in their book, The Standing Stones of Europe, in the Shetland Islands at latitude 60 plus north, the major lunar standstills north become circumpolar, never rising nor setting. Because the Earth's axial tilt has changed by nearly half a degree since the majority of stone circles were built, the circumpolar Moon was visible in the Shetlands in neolithic times. It is not quite circumpolar today - according to the formula in Philip's Astronomy Dictionary - polar distance of 90 less Moon's declination should be less than the observer's latitude for the Moon to become circumpolar. Result is 62 : two degrees out. So terrestrial latitude would have to be 63 north for a lunar standstill north to be truly circumpolar today. The reverse would be the case in the southern hemisphere. What I have tried to do in this article is to show how the lunar standstills are part of a whole cycle of the Moon, in its fullness and quarter phases over an 18.6 to 19 year period. I have not given dates when the Moon is literally at its lowest or highest declination as I do not have software adequate enough to find these exact dates and time quickly. The Stars and The Stones. Ancient Art and Astronomy in Ireland. Martin Brennan, (Thames & Hudson 1983). Now under a different title: The Stones of Time, Calendars, Sundials and Stone Chambers of Ancient Ireland, (Inner Traditions 1995). The Secret Language of the Stars and Planets. A Visual Key to the Celestial Mysteries. Geoffrey Cornelius and Paul Devereux. (Duncan Baird Publishers. 1997). Prehistoric Astronomy and Ritual. Aubrey Burl, (Shire Archaeology, 1983). The Standing Stones of Europe, A Guide to the Great Megalithic Monuments. Alastair Service and Jean Bradbery, (Weidenfeld & Nicolson, London, 1996 edition). Astronomy Before the Telescope. Editor, Christopher Walker. (British Museum Press, 1999 edition). Chapter on Archeoastronomy in Europe by Clive Ruggles. The Eagle and the Lark, A textbook of predictive astrology, Bernadette Brady, (Samuel Weiser Inc. 1992). Gives detailed information on the Saros series of eclipses and explains their astronomy. Solar Fire v5. & American Ephemeris for 20th and 21st Centuries. Diagram by Tina Smale of Ethix Design (www.ethixdesign.co.uk). Jean Elliott works as an astrologer in Leominster, Herefordshire (www.starwaves.co.uk) and is a Director of astrologycollege.com which provides correspondence courses (distance learning) in astrology from beginners to advanced level; (astrologycollege.com is a member of the Astrological Guild of Educators International). Jean is also involved in the Wheel of Astrologers, a group of friends united by a love of astrology who hold outdoor gatherings and camps and work at outdoor events such as Glastonbury Festival and the Big Green Gathering (www.wheelofastrologers.co.uk). © Jean Elliott, DFAstrolS., RCAstrol., 2005.